Something about the transience of adolescence never fails to inspire. More often than not we wake up, 20, fully grown, and confused as to how we got there. For this reason, mangaka like Kamio Youko are a particularly rare breed. Time and time again, she manages to lushly recreate both the frame of mind and the emotional state of adolescence for her readers. Matsuri Special, her latest manga in a successful career is no exception. Matsuri Special is, often unrelentingly, a shoujo manga. The character relationships are complex, and often too fluid to keep straight. It saves itself from the trappings of other shoujo manga by showing none of the indulgence seen in this genre: Matsuri Special is human in scale, and humble in telling. Matsuri is fifteen and irate. She wants nothing more than to sink into the fabric of her class and sneak glances at the boy she likes. Unbeknownst to her classmates, she returns home daily to her father’s pro wrestling gym, donning a mask and a mid-drift bearing sailor uniform as the masked wrestler “Honey Princess”. Like any other teenage girl she does everything in her power to conform, but is still pegged as “muscle girl” at school by her classmates, due to the wrestler’s physique she is unable to hide. Though a talented wrestler, she longs for greener pastures; envious of her classmates who sing karaoke after class and go on dates. The manga begins with fellow classmate, and pro wrestling otaku Shigematsu Arata discovering her secret, and joining her father’s gym, much to Matsuri’s disdain. Adolescence is contradictory, uncomfortable, and occasionally unbearable, yet its brilliance is impossible to recreate. From a sign reading “Matsuri changing, come in and I’ll kill you”, to Arata’s tiny apartment covered in posters of Honey Princess, Matsuri Special is filled with hints at the things its cast is too shy, too proud or too afraid to say, but can’t bear not to communicate. Wrestler girl? Played straight? How nice. I remember characters from School Rumble who were female wrestlers but that manga clearly isn’t serious. I suppose this one is serious, though I sense there’s humor in it too. I think the quote that says Mastsuri is changing, if we come in she will kill us… says a lot, a whole lot. This title sounds fascinating, mainly because the odd premise (a teenage girl wrestler? Whut?!) comes across as a quirky analogy for the generic problems associated with growing up and all the inner turmoil that entails. Perhaps surprisingly some of my favourite anime and manga titles are shoujo or josei…at the end of the day though, good storytelling can’t be restricted by the genre and demographic pigeonholing so maybe I ought to learn how not to be surprised every time that happens. The whole idea of wanting to fit in with those around you when your own life is setting you apart from the norm reminds me a lot of Translucent actually. That was marketed as a shoujo title and features a teenage cast of characters but it was originally serialised in Comic Flapper, a seinen magazine! Its premise isn’t *quite* as bizarre as this, but it’s still a really touching story, told with warmth and a few dashes of humour. Sadly, Dark Horse has the latter volumes on indefinite hiatus, which is a real shame. I’d love to get hold of an English translation of the latter chapters. I wouldn’t think it surprising that many of your favorite manga titles are shoujo & josei. Frankly, it’s a particularly overlooked genre: a given, the vast majority of shoujo titles (anime and manga alike) are absolute drivel, but at its best it produces stories like Revolutionary Girl Utena. In comparison to shounen and seinin, shoujo narratives tend to be more character-driven, as opposed to the sweeping grand narratives/worlds that shounen tends to offer. It’s not that I think the latter worse narrative, it’s just that when trying to flesh out a world (which shoujo often doesn’t concern itself with), it tends to not leave you enough page real-estate to develop characters to the depth that shoujo and josei generally do. Eden succeeded in both fleshing out its characters and its world, as did Fullmetal Alchemist, Naruto and One Piece – the thing you’ll notice all three of these have in common is their gargantuan length. Many josei create equally powerful stories on far smaller scales. The thing about Matsuri Special is that its presented in such a… grounded fashion that you never catch yourself thinking “this is kind of weird.” Its no more weird than being the son of the man who owns the local corner store, and seeing all the weird things that people in the neighborhood buy, in many ways, and I think that’s a part of the lesson Matsuri needs to learn in all of this. I find that one of the major problems in shoujo manga tends to be the strong focus on the main characters. There can be two or three, sometimes four good characters, while everybody else are paper-thin personalities with very little character development over the whole story. This works fine in one-shots, but is longer stories it becomes a serious problem. I notice that the rare shoujo manga series that I like usually don’t have quite so “faceless” side characters. Kaichou wa Maid-sama and Fruits Basket come to mind as examples of this. I’m not sure if the same problem applies to josei, I haven’t read many josei series. 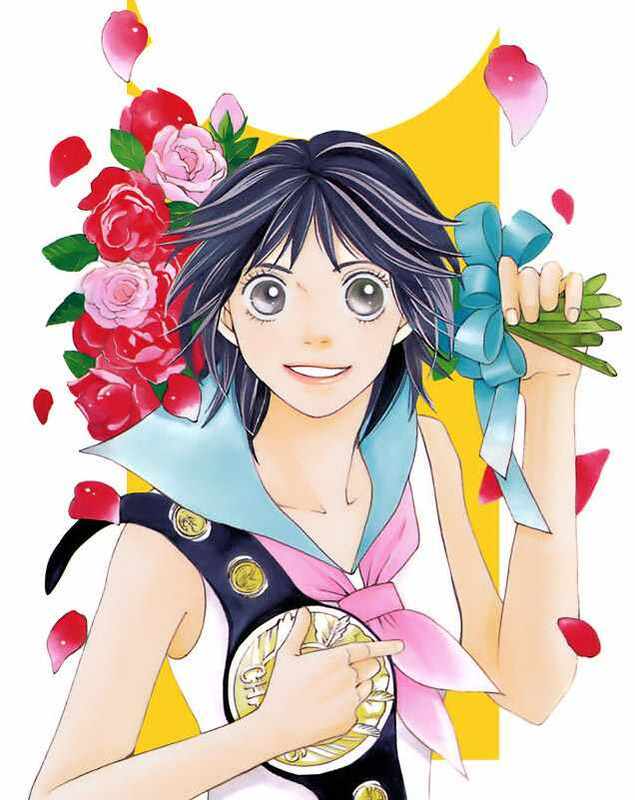 Usagi Drop is my one and only favourite josei manga, and it doesn’t fail to deliver memorable side characters. I’m not sure Bleach is a good example of what I mean. Sure, there are some one-dimensional characters, but overall I’d say many side characters are more interesting than the main characters. Shounen manga typically present an army of characters, and there are bound to be some who don’t get the development they deserve, but usually there are some side-characters who do. Many a shoujo mangaka apparently don’t see the need to use more than a few side characters, and those few often get no development at all. Thanks for the tip, I’ll check out some of his works.